With numerous financial significations and, with Venus indicating the opposition party and the 6th house trade unions and workers, could there be some stabilisation offered by these to some degree, by way of inventive yet unexpected proposals? The Aries ingress chart for the UK is fixed in Ascendant sign Scorpio, co-ruled by Mars and Pluto, which form a very close trine to one-another (17’ orb) between the 3rd and 7th houses. 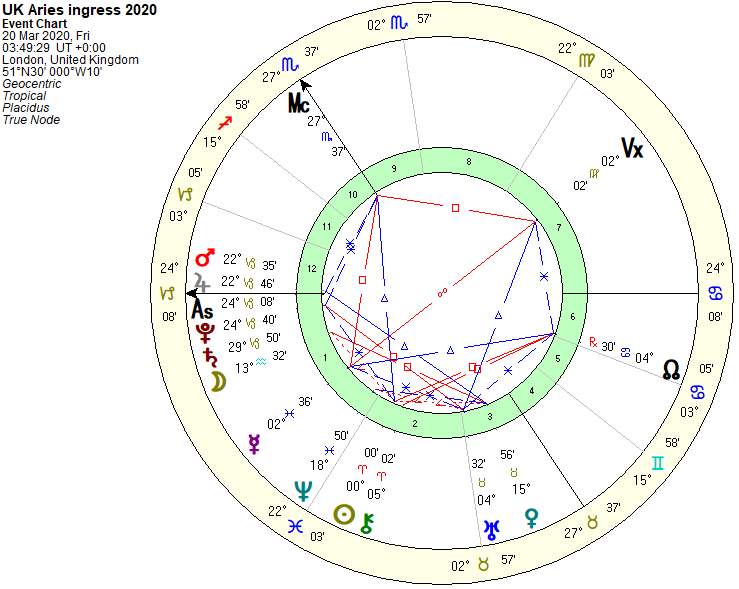 This means that this predictive chart for the full year ahead tells us the UK may potentially be locked in deeply transformative negotiations with neighbouring countries for the whole duration, right up until the next Aries ingress of 2020 (or from the end of March 2020). Mars and Pluto are in Taurus and Capricorn, respectively, so are likely representing for the UK negotiations of a most practical and concrete nature and, although Mars inhabits the UK’s 7th house and is both in detriment and accidental debility, potentially representing conflicts with other nations, the aggressive energies of Mars may be somewhat subdued through Taurus, especially since he also forms similarly close angles with both Venus and Jupiter. Even though these are respectively a square and a quincunx, this hints to me that Mars may represent something of a relatively peaceful conflict; after all, the 7th house is a house representing both allies and open foe and the 3rd the house of both neighbours and communications. 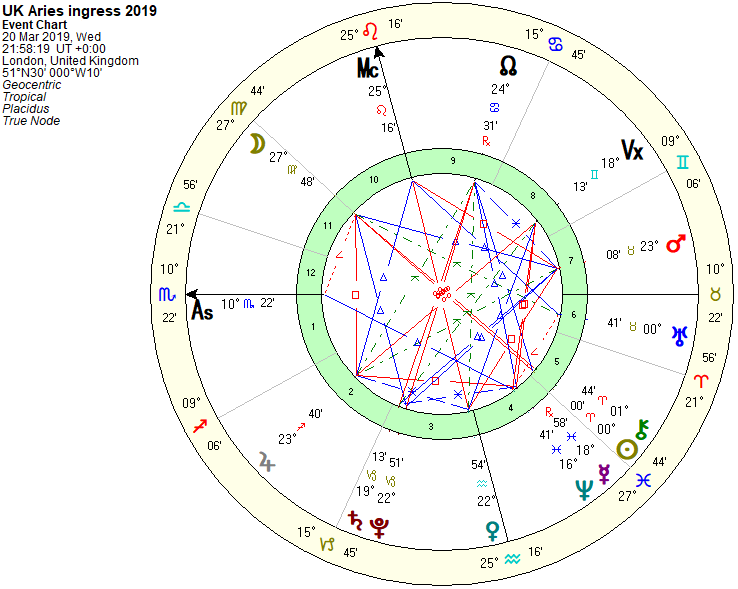 The UK’s Aries ingress for 2019 is certainly not an overly fiery chart, either. Because, as a country, we have been making ‘deal’ preparations to leave the EU since June 2016, which should involve many new trading deals with our neighbouring countries, new workers and business laws for citizens including civil servants and manufacturers, new immigration laws and even potentially a new hard border between Northern Ireland and the Republic of Ireland, these aspects are what I believe to be really good representations of what is currently happening in the UK. This brings me to the Moon and the Sun, which are in opposition, indicating the divides and on-going balancing acts between the population of the UK and its government. UK citizens watch on in confusion whilst Theresa May tries her best to come up with a deal that will suit as many people as possible (after the vote to leave the EU was at 51.9% back in 2016). As a leader she has recently experienced a lack of majority support in the House of Commons for a second time proposal of her withdrawal deal, another signification of the Moon in the 11th house in opposition to the Sun in Leo. Something else which is quite significant, is the fact that this ingress chart casts only around 3 hours and 45 minutes before the chart for the Full Moon in March, at 00° Libra, so it very much expresses many similar energies of the Full Moon, which may of course provide us with plenty of hints towards an energetic snapshot of the Full year ahead, until April 2020. Read my March 2019 Full Moon article. The MC in Leo is ruled by the 5th house Sun, which is then disposed to the 7th house Mars, so it makes sense to say this represents the House of Lords and our government as integral parts to the cog-works of what is happening as a whole this year, bringing our country, the UK, very much into the limelight amongst neighbouring and friendly countries, as they all pay attention to watch what we are going through as a nation, particularly with the Brexit debacle. But what exactly does the 5th house Sun signify in this chart? Is it only the government and the House of Lords or will further 5th house significations come into play throughout the year, such as our youth, sweepstakes, speculation or sports and recreation? The Sun very closely conjoins Chiron. Does this does hint towards wounds involving the UK’s identity and perhaps a subsequent healing process? I would then suggest that further 5th house signification highlighted in this ingress chart might be speculation or more specifically, the volatility in value of the British pound, which is something that has made the UK public somewhat uneasy since 2016 hence, also ties in with the signification of the opposition between the Sun and the Moon. Moving on to another significant aspect in the chart, which is the Mercury-Neptune conjunction in Pisces, with Mercury in retrograde, both in the 4th house, which likely signifies the amount of confusion as to what is going on in our country and especially, the general emotional mood of the UK being disorientation and lack of clear direction, as we are all unsure as to what might be happening next. Other 4th house significations are agriculture and farmlands, therefore communications in legislature and results in this area specifically might be slow and inconclusive, for the year. On a more serious note, farmers are reported to be especially distressed by ‘uncertainty over their futures’ and are said to be in crisis while at an increased risk of suicide. 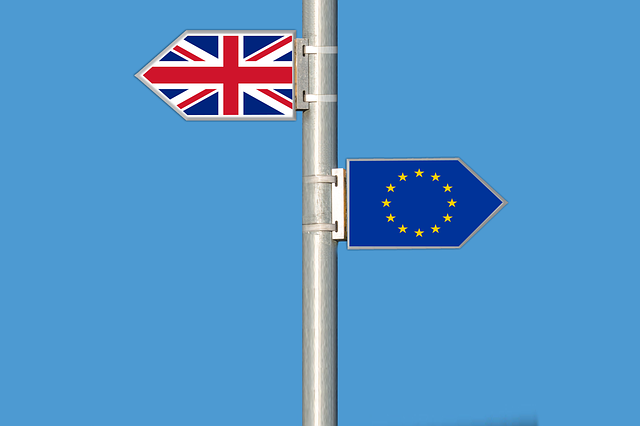 Brexit, the resultant fall in value of farmland and farmers’ continuing struggles following 2018’s drought and storms have been supposed precipitants of this struggle. (The Guardian, March 2019). This brings me to the IC, to which Venus is conjoined. Venus is the only planet which is so closely conjoining one of the angles and the 7th house Mars is disposed here as well as tightly squared. There is also a beautiful sextile from Venus here to 2nd house Jupiter in domicile, which trines the MC and Venus is in mutual reception with Uranus (having just entered Taurus) in the 6th house. With numerous financial significations and, with Venus indicating the opposition party and the 6th house trade unions and workers, could there be some stabilisation offered by these to some degree, by way of inventive yet unexpected proposals? It has been stated that maybe a new proposed way of dealing with the Brexit problems might be helpful, with former labour MP, John Major, suggesting a cross-party government come together to make decisions if need be and a letter from both the TUC and the CBI asking Theresa May to change her direction to think about workers and businesses in an alternative approach following her second rejection. Whatever happens within the UK this year might not be too bad for the economy. I’ll go as far as to say it might even be good. After all, although the GBP has been volatile these past few years, we have seen some solid increases since 2017 following some perceived certainty in our directions on exiting the EU when article 50 was invoked. So, overall, although farmers and agriculturists in particular may feel they are condemned to wade through the hazy waters of ‘what’s happening to our livelihoods? !’, some aspects of our economy could well receive a boost yet it may still be a difficult year regarding communications, administration, the UK’s overall image and tensions between the UK and neighbouring countries. So, will there be a Brexit deal this year? I don’t know, but with the fixed Ascendant sign, Mars in fixed Taurus in the 7th forming a grand Earth trine with Pluto-Saturn in Capricorn and the Moon in Virgo, there does seem to be plenty of ‘staying power’ indicated and concern about properly structured and deep communications regarding trade legislation and borders. Although there is the Neptune-Mercury in retrograde conjunction indicating the on-going confusion, I don’t perceive anything too harsh in the chart as a whole (which I feel would indicate a no-deal Brexit), so I find myself wondering if Theresa May will keep asking for time extensions and battling it out for a longer period of time, in the hope of finding a fair deal for as many people as possible, or whether the opposition party and trade unionists will step in to help soften the deal (or both). This could mean a softer Brexit or to even remain in the EU with greater freedoms, any of which we could begin to see very positive signs of from around March 2020 and then this might really start to move on in time for the 2020 ingress. Whatever happens, even if a deal is reached before March 2020 (or March 29th 2020), the UK chart does suggest that the potential feeling of sweeping changes, freedom from this Brexit confusion or a release from this sensation of deadlock might not happen until then. I’ve also had a sneak peek at the 2020 ingress. The Ascendant will fall in Capricorn, conjoining Pluto, Mars, Jupiter and Saturn, so I can imagine swifter movements ahead in legislature, trade deals and the UK’s core changes to be clearly underway by then. Pluto so tightly conjoining the Ascendant suggests that the 2020 changes could reach deep into the roots of the way the UK operates with other countries and become quite transformative for the UK.